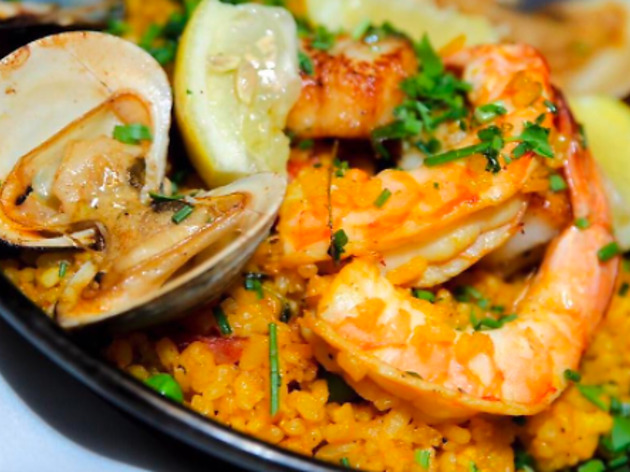 This Washington Heights bar and restaurant serves primarily seafood influenced by the cuisine of the Mediterranean. Start with some wine, either by the glass or the bottle. Then, order the East Coast oysters ($2.50 each) or chilled Maine lobster ($18) from the raw bar. Other appetizers include a grilled watermelon salad with arugula and ricotta ($8), baked clams with garlic, chili and lemon ($14) and harissa-glazed pork belly with charred fennel and green apple ($9). 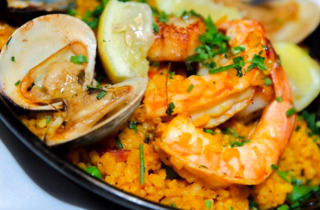 For the main course, choose between entrees like tagliatelle with scallops, roasted tomatoes and olives ($16), wood-grilled branzino fillet with romesco sauce ($14) and surf and turf with flatiron steak, scallops, prawns, mussels and potato puree ($28). And don’t forget to save room for desserts like guava cheesecake with ginger streusel, strawberry gelée and coconut snow ($7) and honey–olive oil cake with pistachio mousse and apricot-lavender coulis ($7).